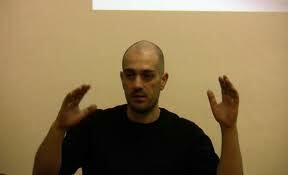 Vassily Bourikas programmes the Experimental Forum at the Thessalonikki International Film Festival. His passion for the format, combined with an exceptional ability to root-out lost and forgotten film artifacts, make for viewing experiences quite unlike any other. His Amantes Sunt Amentes programme, seen at the 50th edition of TIFF in November 2009, brought together: unknown 8-gage films by the Serb, Ljubomir Šimunić; an equally obscure feature-length film made by Hollywood character actor, Timothy Carey; Super-8 epics from Jeff Keen, an overlooked progenitor of the early British underground; and sui generis feature film experiments by the mad Italian theatre director, Carmelo Bene. Seen together, these works have the effect of demolishing notions one might have that experimental film is a completed project. You are currently browsing entries tagged with Jack Smith at Army of YouTube.